From next month, junior officers in the public sector who turn 62 will not suffer a pay cut when they are re-employed, a move that the labour movement had called for a week ago. These Division III officers, who do mostly clerical and front-line customer service work in ministries, earn between $1,300 and $2,100 a month. There are about 11,700 of them in the public sector, but most are below the retirement age of 62. However, the policy change that aims to coax older workers to continue working does not automatically apply to senior officers. The Public Service Division (PSD) said yesterday that while more senior officers at Division I and II will continue at the same grade and salary, some will have their salaries reduced by up to 15 per cent. The cut for these officers, who include teachers and management support officers, is in line with private sector practices, said the PSD, the human resource arm of the Government. It also disclosed for the first time yesterday that the no-pay-cut policy was first applied to the lowest Division IV rung of officials like filing clerks since April last year. 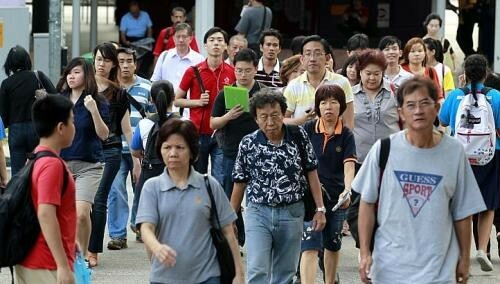 About 130 of them were re-hired at their existing pay between April and December last year, it told The Straits Times. As for senior officers, it gave figures to show that most did not suffer steep pay cuts. Fewer than one in five of about 1,150 re-hired at lower pay last year had their salaries cut by more than 20 per cent. Only 1 per cent bore the full brunt of the 30 per cent reduction. "With the revised terms (from next month), we hope to encourage more able officers to continue working after they turn 62," said Mr Tan Hoe Soon, a PSD director. The National Trades Union Congress, in calling for the change, produced its poll of 118 unionised companies to show that eight in 10 did not reduce the pay of re-employed workers doing the same job. Unionists yesterday cheered the PSD's move. "The NTUC and public sector unions are happy that the PSD has responded positively to our feedback and calls to review its re- employment pay policy," said the labour movement's deputy secretary-general Heng Chee How. Added the Amalgamated Union of Public Employees' general secretary Ma Wei Cheng: "Any employee who is offered a lower grade and lower pay has to have his roles and responsibilities reduced accordingly." The chairman of the Government Parliamentary Committee for Manpower Zainudin Nordin described the change as a "positive step", but urged the PSD to continue to review the 15 per cent pay cut for senior officers. "The principle must still be to pay according to the job, not age," he said. A school clerk in her 50s, who cannot speak to the media without permission, said she would now consider working after 62, since there is no pay cut. "For those re-hired earlier at lower pay, I hope their salaries will be adjusted," she said. "Otherwise, it is unfair."